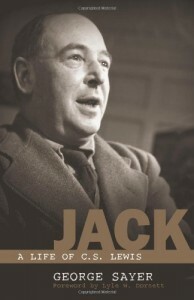 Clive Staples Lewis (1898-1962) was known a ‘‘Jack’’ to people who knew him. George Sayer was a student and then associate and friend of 29 years. The personal insights into the habits and idiosyncrasies of such a complex person makes the book very interesting. Reading about a man like Lewis is profitable for any of us who need to be reminded of our relative shallowness. The sheer volume of his reading and writing was incredible. It was due largely to spending a childhood in a large house with nothing but books and a vivid imagination and without any other entertainment. He devoured the classics and loved mythology and had a working knowledge of quite a few languages by the time he was out of grade school. He retained his love for classical styles all his life including the old English dignity of the classroom and of the church service. The best statement in the book is Lewis’ description of his own conversion. ‘‘It was more like when a man, after a long sleep, still lying motionless in bed, becomes aware that he is now awake.’’ Even though an Anglican, Lewis’ late-life conversion was obviously genuine. Sayer takes one large exception to the film ‘‘Shadowlands.’’ The film suggests that Lewis lost his faith after the death of his wife. Those who knew him well would never draw such a conclusion as Lewis’ last words vividly show. But film must sell; not necessarily be accurate. Sayer also implies that the film was derived from biographies that make Freudian evaluations of Lewis, which Sayer readily rejects. Also, Sayer defends Lewis’ use of witches and similar characters in the Narnia series. Many refuse to use these books because they believe they promote the belief in such things. Sayer quotes Lewis to the contrary and regrets that children would be deprived of them for such reasons. This book also serves as a colorful anthology of Lewis’ works which makes it worth the price.